Welcome into Crocodopolis. Actually the slots name was given by the Greeks, and it means the Crocodile City. 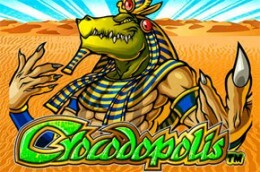 Crocodopolis has a Egyptian theme with related symbols and graphics. The game is a 5 reels and 25 paylines slot game powered by NextGen Gaming. Crocodopolis is compatible with Windows and Mac operating systems. Crocodopolis offers to its players multipliers, wilds, scatters, expanding wilds, and free spins. The lower value symbols are the standard playing cards (9, 10, J, Q, K and A), while the higher value symbols are theme-related and they include hieroglyphics on papyrus, an ankh, an scarab and Egyptian gods. The wild symbol is represented by the Crocodile God.